Robert J. (Bob) Schadewald (1943-2000) was an author, researcher, and former president of the National Center for Science Education (NCSE). An internationally recognized expert on pseudoscience, Schadewald penned numerous articles on creationism, perpetual motion, flat earthism, and other pseudoscience for such magazines as Science 80, Technology Illustrated, Smithsonian, and Science Digest. 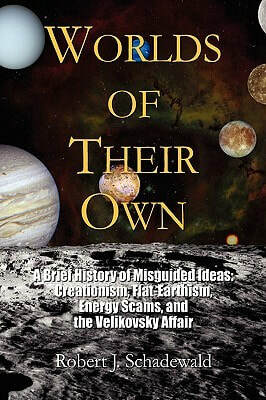 Worlds of Their Own: A Brief History of Misguided Ideas: Creationism, Flat-Earthism, Energy Scams, and the Velikovsky Affair, is a book by Robert J. Schadewald. History is written by the winners; including the histories of science and scholarship. Unorthodoxies that flourish at the grassroots are often beneath the contempt of historians. Zetetic astronomy (flat-Earth science) was a household term in Victorian England, but not a single reference to it is found in conventional histories. We ignore such histories at our peril; the modern "intelligent design" movement is almost a carbon copy of the 19th century flat-Earth movement in its argumentative techniques. Such alternate histories flourish in popular culture. The New Age propaganda website Gaia.com is filled with Pseudo-scholarship. Pseudo-scholarship is a work (e.g., publication, lecture) or body of work that is presented as, but is not, the product of rigorous and objective study or research; the act of producing such work; or the pretended learning upon which it is based. It is clear that New Age and its obsession with science, and lack of scientific knowledge or education, is filled with pseudo-scholarship. So, Gaia.com is prophesying a New World Order (New Age) to emerge: the world of Alernative History, Alternative Physics, Alternative Medicine and, ultimately, Alternative Reality. How, given the recent and sorry story of ideologically motivated conceptions of knowledge – Lysenkoism in Stalin´s Soviet Union, for example, or Nazi critiques of “Jewish science” – could it again have become acceptable to behave in this way? We need to find the answer in American anti-intellectualism and anti-science (see the Matrix Dictionary entry Anti-intellectualism and Anti-science). When orthodox science finds itself stumped, or a certain segment finds it unpalatable, the unorthodox may rush in to fill the void. The past two decades have brought a surge of interest in the history and philosophy of science. But how do we discern between pseudo and actual science? To fully understand what science is, we must understand what science is not. Written with penetrating insight into the minds of alternative thinkers, this book throws light on the differences between pseudo and actual science. The droll humor that permeates Worlds of Their Own makes it as enjoyable a read as it is enlightening. Despite its focus on unorthodox ideas, Worlds of Their Own is about human nature. Whether they drew their ideas from the Bible or nature, all the pseudoscientists discussed in this book were driven to communicate their "truth" to the misinformed world. None was afflicted with self-doubt. All defended their "truth" with similar standards of evidence, modes of reasoning, and methods of scholarship. Their counterparts are legion - the blue-collar philosopher who refutes Einstein from his barstool, the preacher who refutes (but cannot define) evolution from his pulpit, the narcissist who promotes quackery courtesy of modern talk shows and infomercials. Each topic discussed in Worlds of Their Own covers a once-popular concept that persists to this day. It is a puzzle to me why the critics of the theories in the book don´t realize that the newest trend on universities all over the world, Social Constructivism, actually can justify all the theories in a rather sophisticated way (read my article Constructivism: the postmodern intellectualism behind New Age and the Self-help Industry). The title Worlds of Their Own describes very well the advocacy of philosophical idealism within the environment of pseudoscience. Idealism assert that reality, or reality as humans can know it, is fundamentally mental, mentally constructed, or otherwise immaterial. Epistemologically, idealism manifests as a skepticism about the possibility of knowing any mind-independent thing. In contrast to materialism, idealism asserts the primacy of consciousness as the origin and prerequisite of material phenomena. According to this view consciousness exists before and is the pre-condition of material existence. Consciousness creates and determines the material and not vice versa. Idealism believes consciousness and mind to be the origin of the material world and aims to explain the existing world according to these principles. It is clear that idealism, like social constructivism, can justify the theories discussed in Worlds of Their Own. But idealism is very easy to debunk. I have done that several places, for example in my article Simulation Theory. Idealism is the principle philosophy of The Matrix Conspiracy.